Question: Do you breed and/or sale capybaras? Answer: No. If you contact me with a polite email, I may be able to put you in contact with a breeder. 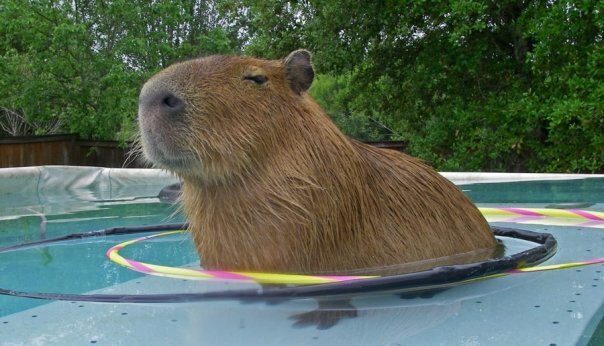 Please review my blog carefully and make sure you have the time, the means and the patience to deal with a capybara. 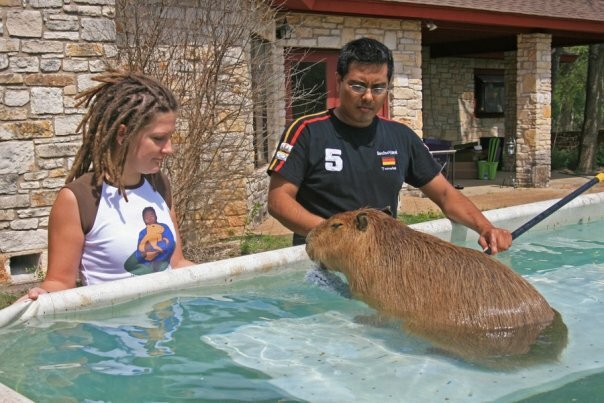 Question: How much does it cost to get/keep a pet capybara? Answer: A lot! We are very demanding animals. You can read my blog post How Much Is That Capy in the Window for detailed information. 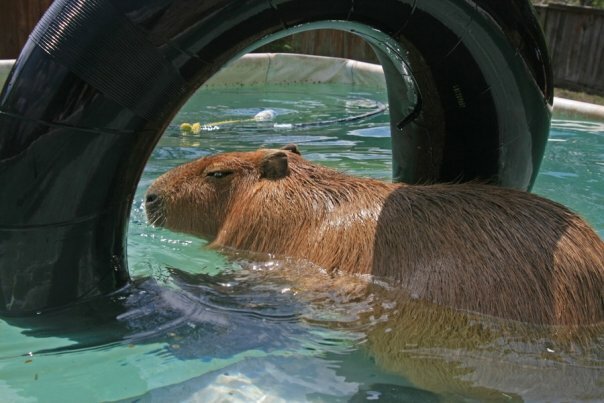 Question: What is it like to live with a capybara? Answer: This blog should give you some idea but there are two posts which might be of particular interest. The first is Life With a Capybara, which is about Caplin Rous. The second is Jack and Jill and Garibaldi, which is about me, Garibaldi Rous. 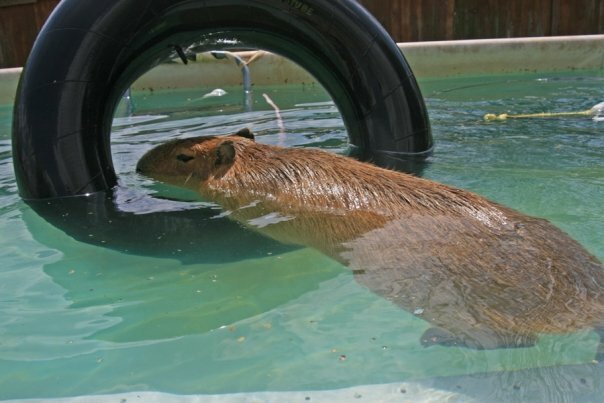 There is also this great interview of Melly by Jeff VanderMeer, The Fantastical Capybara. Answer: Yes! All animals dream. Here’s a link to a video of Caplin Rous dreaming. Question: Are you very vocal or are you more on the quiet side? How do you communicate with people and other animals? Answer: Melly says I am much quieter than Caplin Rous was. I make the same sounds he did, but not as often. 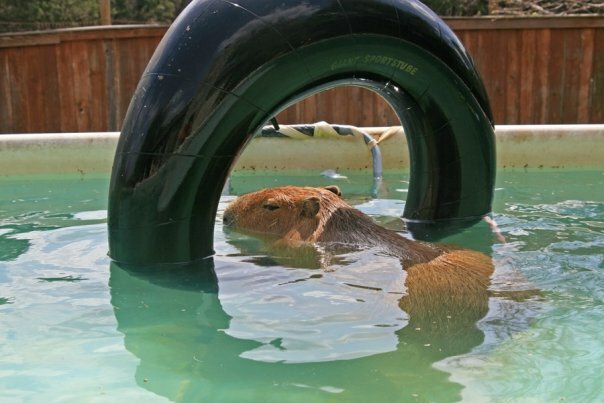 Capybaras make sounds similar to guinea pigs, only not as loud. We also have a bark. Here’s a video of Caplin Rous’ bark. And here’s a video of some of his language skills. Here’s another one where he was distressed because Melly had to go to work, it is called Eeping for My Owner. The squeaky, plaintive sounds we make are called eeps. Oh, and I have a roar that I make when I’m causing trouble and I want someone to know it. Dobby Winnick has a bray like a donkey (makes sense, knowing him). Question: Do you make a few or a lot of different vocal sounds? I mean, I know you make adorable “eeps”, usually to ask for something (like treats from Mely), but… how many different “eeps” or “grrss” or other sounds you make? And what they mean? Answer: I kind-of answered this already but I decided to add more. Eep is the word for the sounds I make that have a little bit of a squeak in them, a rise in pitch at the end. They are a bit plaintive. The book Capyboppy by Bill Peet describes our typical voice as tweedle-tweet. We do get confused with birds sometimes. But when I am happiest, I make a sound like a Geiger counter and the more low-pitched and long duration the individual “counts” are, the happier I am. And then there’s my bark for when I’m excited or startled. Question: How do you get along with guinea pigs? 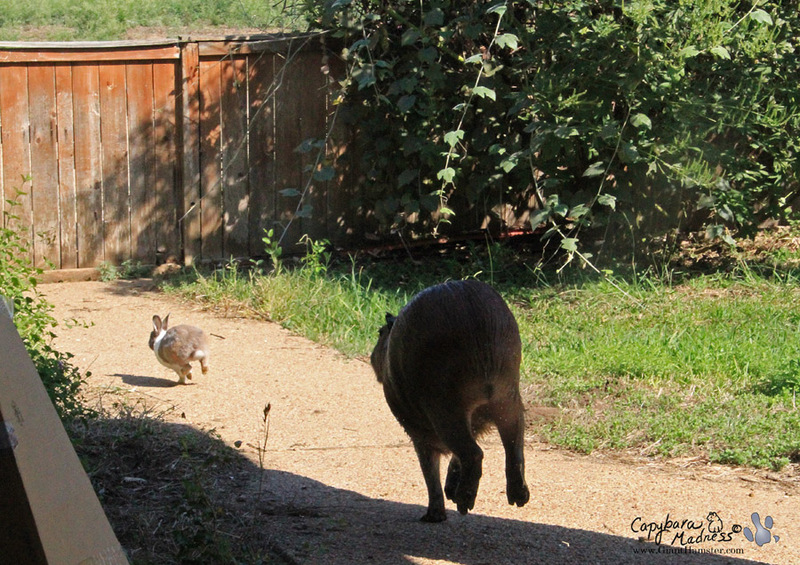 Answer: Size is a real problem when a capybara interacts with a guinea pig. We basically understand each other’s language, so that is nice. But it is too dangerous for us to be together without close supervision. One misstep and, well, you know. Question: Do your relationships with other animals vary according to the animal? Answer: Very, very much! A good example of this is that I love to chase Maple WoMER but I never chase Oakley bunny. This could be because Oakley won’t run away from me which makes chasing not very much fun. When Flopsy the Killer Cat comes to visit me, I always try to get him to scratch my belly but he never will. The only animals I don’t like are dogs, and it’s really not that I don’t like them, it is just that they scare me. Question: I know your fur is not very soft but what about your nose? Answer: My nose is the softest part of my body. And my little lips. And my belly. But maybe the nose is softest. Still, it is not as soft as a rabbit and it is very close to my very sharp teeth. Question: Are your ears soft and delicate like a hamsters? Answer: No, not really. Our ears are soft but they feel more like leather. We’re too big to be delicate. Question: What do you do all day when Melly is at work? Do you spend the whole day sleeping? Answer: Rick is usually home with me but he isn’t as interactive as he should be. Still, he usually takes me swimming two or three times during the day and often we go on walks around the outside of the house. Other than that, I graze, I chase Maple, I sleep in the sun, I eat a little lettuce and/or corn. Question: How much of the day do you spend sleeping? 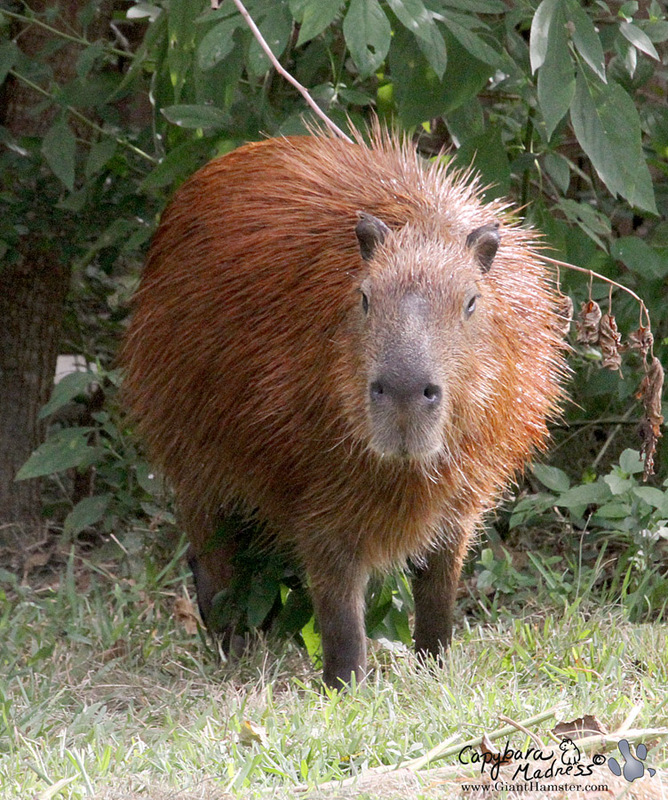 Answer: You may have heard/read that capybaras are nocturnal. This is not true. We are only nocturnal where people hunt and persecute us. You would be too if someone was coming after you with a gun! I do take naps during the day but I sleep pretty much through the night except for an occasional snack. I like to get up just before dawn and go to sleep right around sunset so during the winter I get more sleep than during the summer. Question: Do your co-pets like you or are they scared of you? Answer: I think they like me. They are not afraid of me or Firetail wouldn’t steal food right out of my mouth! Maple’s not even scared of me, she just likes to run. Flopsy the Killer Cat is scared of me but he’s not exactly a co-pet. I walked through the house looking like this. Actually, I was muddier. Question: I know you enjoy swimming in your pool and rolling in mud. You also spend a lot of time in the house, so I am guessing that you take a lot of baths or showers. How does Melly get you clean, and do you enjoy it? Do you have a favorite shampoo? Answer: I never take a bath or a shower or use any kind of soap. When I get muddy, like in the photo above, Melly either hoses me off or forces me to go into my little green wading pool where I roll until I am clean. I don’t understand why mud isn’t allowed in the house anyway. It looks perfectly nice on the walls, carpet and furniture. 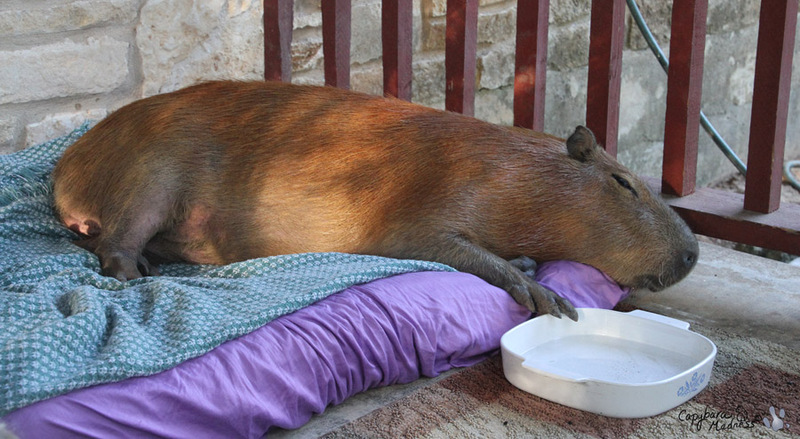 Question: I was wondering if you’d like a capy friend or spouse, or if you prefer the carefree, bachelor life? Answer: Since I am neutered, I think there’s not much point in not remaining a bachelor. I already have a lot of friends with my co-pets and my stalkers and Melly and Rick. 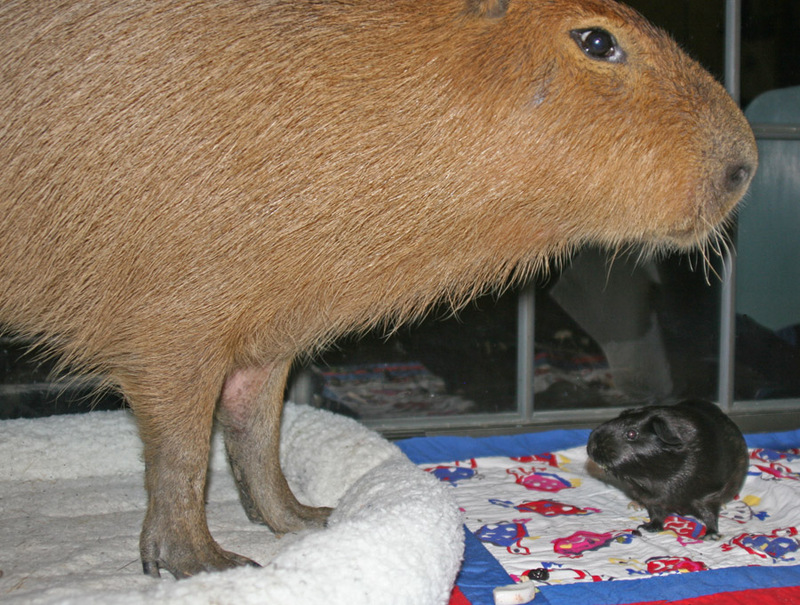 But I don’t think I’d be against a new little baby capybara that I could teach everything I know. 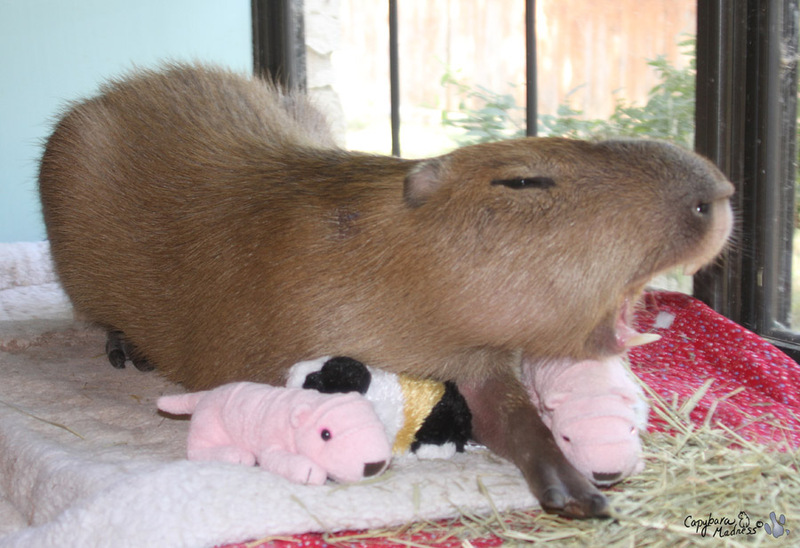 Male capybaras can’t be kept together so it would have to be a little girl. I bet I could teach her to be the best roller ever! Question: I was wondering if you just have the front 4 incisors or if you have more teeth hidden in the back. Answer: I have more teeth in the back, big flat molars for chewing grass, which is pretty tough stuff. Altogether, capys have 20 teeth. 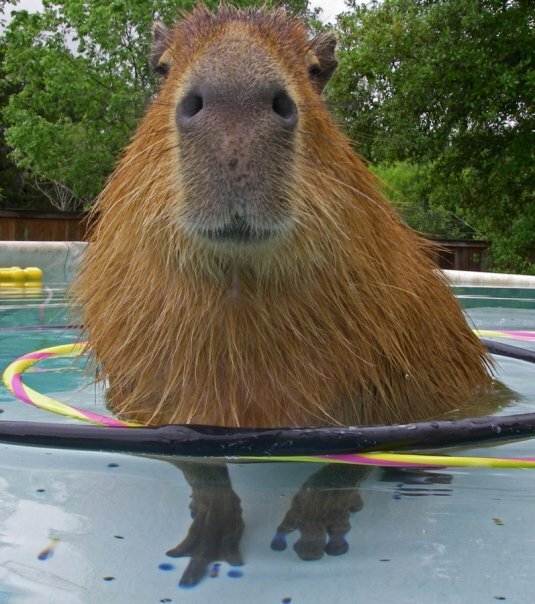 I mean altogether each capy has 20 teeth, not all capys put together have 20 teeth. But you probably knew that. 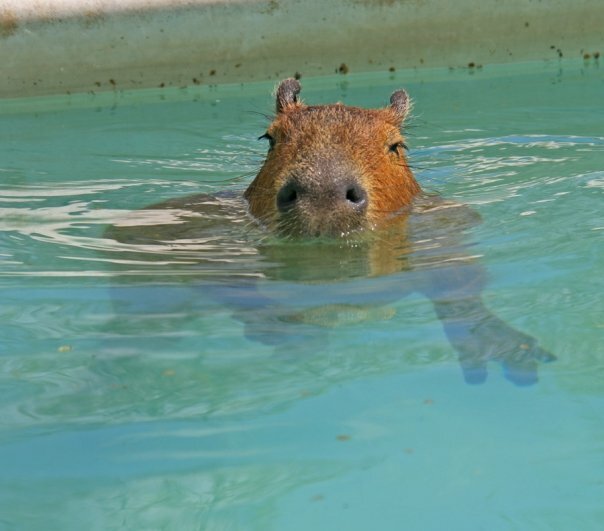 Question: I know you have some very specific food likes and dislikes, in the wild, what do capybaras eat? Answer: Wild capys mostly eat grass. 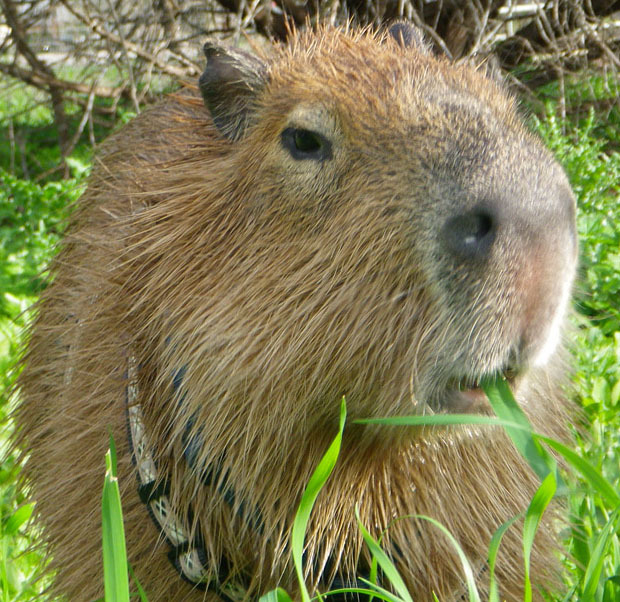 In fact, in Venezuela there is a grass called “capybara grass” because we like it so much. Areas with big capybara populations tend to look like a golf course, we are such good mowers. 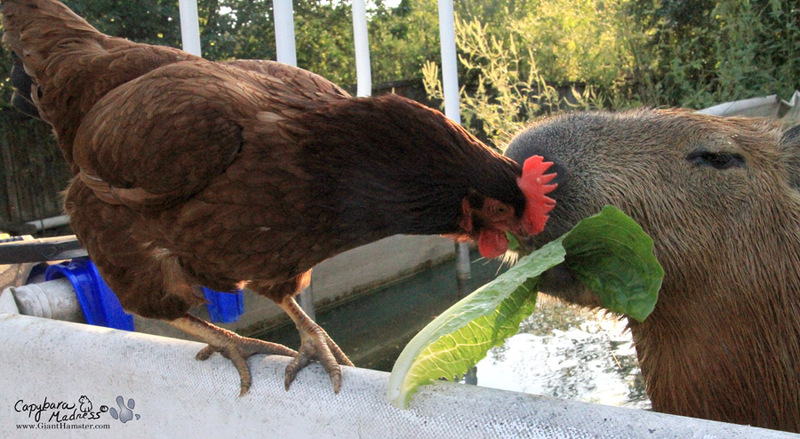 But wild capys will also eat some water plants and some fruit. Question: I want to know if you are smart and affectionate like a dog. And do you come when your name is called? Answer: I am smart and affectionate but not like a dog or a cat. I do not come when I am called unless it suits my purposes. I know a lot of tricks but I only do them for a treat. The better the treat, the better the trick. Capys are very good at recognizing people. Caplin met thousands of people and Melly said he remembered all of them. I’m scared a little so I’m not as good at remembering. Question: (from Dobby Winnick) So, Gari, when are you going to get “Big Boy” fur? Mine is very long and coarse. I’m trying to grow a mane like a lion! Answer: I plan on getting my big boy fur tomorrow. In fact, I’m sure I’ll have it by the time you read this. 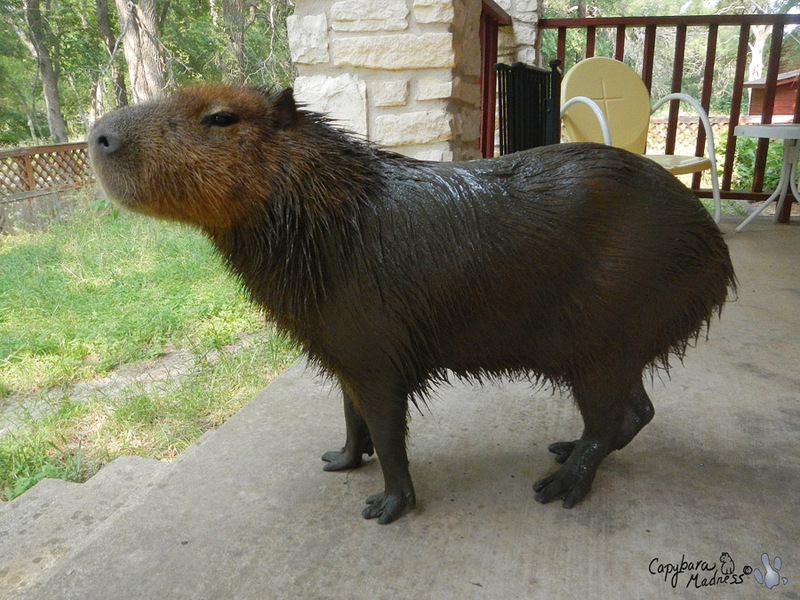 I am a big capybara, after all. Bigger than you, even though I’m younger. Question: As I know you are like the “big cousin” of the guinea pigs, I’d like to know if you pee and poop all over the place like my piggies do, or you only do that when you are into the water. 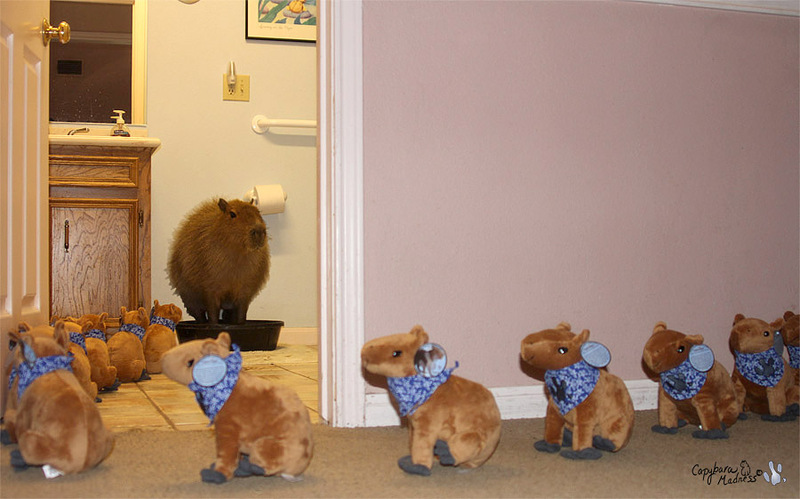 Answer: The photo above shows Caplin Rous using his poop bowl (which is now mine) and a long line of Capycoppies waiting their turn to use the bathroom. Here’s a video of me using the poop bowl. Not all capys are good about this though. 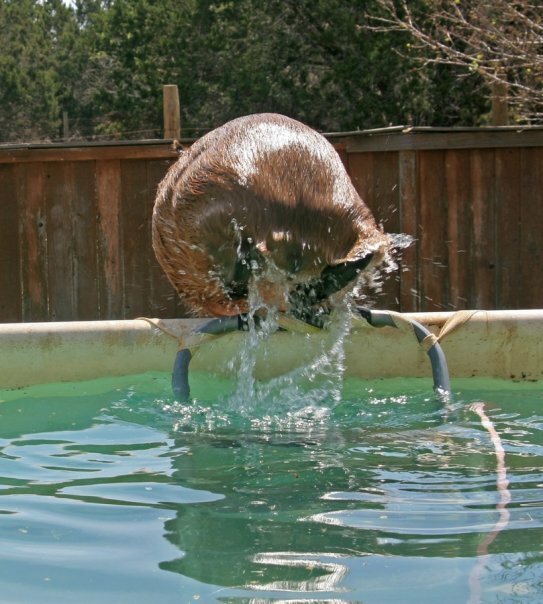 The aforementioned Dobbye Winnick does not go to the bathroom in a water bowl and that is one reason he is an outdoor capybara. Question: Do you, like my bunnies, have a favourite human slave in your household, or treat all your humans with the same amount of disapproval? Answer: Slave is a harsh word. I divide the tasks that I require between Melly and Rick. Melly does almost everything: she feeds me, plays with me, scratches me, cleans my waterbowl, opens doors for me and basically everything I need that I can’t do myself. And Rick is my favorite. Answer: We have a nose so of course we can smell! But seriously, we probably have a slight odor, especially when we are wet. But since we don’t have an undercoat like dogs, and because we go swimming so often, we generally don’t have much of an odor. We do go around marking things but apparently humans aren’t sensitive to our olfactory signals. Read Making My Mark to learn more about that.